We thought about this deep philosophical truth as we were driving a car into a lake. Luckily, this was no ordinary car. We were piloting an Amphicar, the only nonmilitary amphibious vehicle ever produced on a commercial basis. Our assault on the great wet beyond would be made possible by the best engineering that early-1960s Germany had to offer. With any luck, our pants would stay dry and we would see land once again. Designed by Hans Trippel, who was also responsible for the gull-wing doors found on the Mercedes-Benz 300 SL, the Amphicar was manufactured in Berlin between 1961 and 1968. Although the manufacturer hoped to produce more than 20,000 of the floating convertibles per year, fewer than 4000 were ever made. We’ll probably never know exactly how the concept of the Amphicar was pitched to supporters of the company, but someone did an excellent job of convincing the world that a floating car was conspicuously missing from the automotive landscape (or, in this case, seascape). Whatever the sales angle, the Amphicar was assembled with quality pieces and has enjoyed some legitimate provenance in the automotive world. The rear-mounted 1147cc engine came from a Triumph Herald, Mercedes-Benz supplied the suspension and brake components, and the transmission internals were Porsche pieces. The Quandt Group was the manufacturer of record for the Amphicar; the conglomerate of businesses headed by Herbert Quandt even owned significant stakes in Mercedes and BMW. The Amphicar itself was given the 770 model designation, which referred to its top speeds: 7 knots and 70 mph. 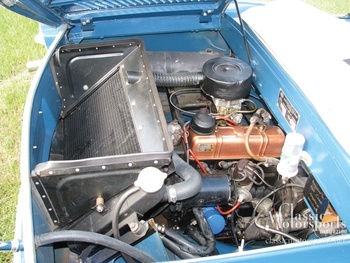 The Triumph powerplant drove the rear wheels through a four-speed transmission for landlubber use, but when the going got wet, the operator would simply throw a lever that engages the twin nylon props. The car would then motor off into the waves. The waves can’t be too big, mind you, although the Amphicar does boast a rather impressive list of maritime feats. Amphicars have crossed the English Channel, traversed the Strait of Gibraltar, and made the passage to Southern California’s Catalina Island. One walk around an Amphicar, and you realize pretty quickly that this is not so much a boat you can drive on land, but rather a car that floats. In fact, until you look real close, the Amphicar is barely more than a small, odd-looking, early-1960s European four-seater. Peek a little closer and you’ll notice a few key details, however. The Amphicar has an upswept “bow” at the front along with a flat bottom. Meanwhile, the engine exhaust exits through a hole well above the rear bumper. And then there’s those propellers. The Amphicar is underpowered by modern standards, but it goes down the road with a great deal of dignity and grace. This is especially true considering its Korean War-era engineering and nearly 2400-pound curb weight. That heft was necessary, however, to keep the sea out and the dry in. In addition to most of the same equipment found in any contemporary Euro sedan—including a folding convertible top on every model that rolled off the line—the Amphicar had several features that no car before or since has offered. The car featured sealed axle shafts in the rear, a bilge pump, and twin props. Plus, each side door had an extra handle that allowed them to close extra-tightly against their flexible rubber seals. Thanks to the generosity of Ray and Michelle Hornsby, we had the chance to experience firsthand the thrill of slipping off our dirt shackles. The Hornsbys’ fully restored 1964 model sees regular use on the lakes of Central Alabama. They brought the car to our neck of the woods to challenge one of our Florida lakes, as well as our roads and test track. 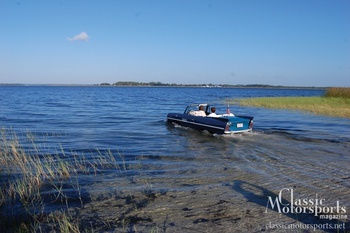 While people usually make a big deal out of the fact that the Amphicar also functions as a boat—largely because it is a big deal that a car also functions as a boat—you never hear much about the Amphicar on the road. That’s a shame, because the Amphicar is a pretty reasonable way to cover pavement. Driving one is much like driving any other small, European sedan from the late ’50s or early ’60s. The steering wheel is big, the brakes are iffy, the handling is soft, and the 43-horsepower engine has a hard time getting the car out of its own way. In other words, it’s terribly fun. Like so many cars of that era, the Amphicar on the road is easily more than the sum of its parts. While the chassis is a little unresponsive, it does communicate well and involves the driver in the whole experience. There’s good feedback through the steering wheel, and none of the controls are vague. Throws on the shifter are long, but you’ll rarely have trouble finding a gear—and it’s usually the one you’re looking for. After taking a few laps of our test track, we uncovered some interesting findings. 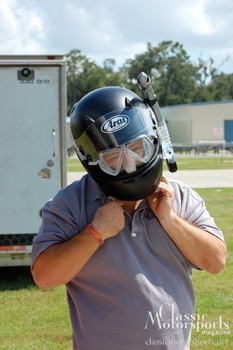 While we weren’t about to take the Amphicar out to any track days, it admirably handled the tight corners and sweeping curves of the Ocala Gran Prix kart track. When you start throwing it around, however, you really notice the weight. Tipping the scales at more than 2400 pounds loaded, the Amphicar is about 800 pounds heavier than a contemporary Ford Anglia. Combined with the skinny tires and nearly 10 inches of ground clearance, the hefty Amphicar handles a bit like, well, a boat. But while it is a bit wallowy, the handling is predictable and fun given the car’s mission. And if that mission should involve taking a hostile beach, the Amphicar is without a doubt your weapon of choice. Launching an Amphicar involves a simple yet profound act of faith: Just drive the car into the water. However, as the opening of this story suggests, powerful survival centers activate in the brain, screaming that what you’re doing is wrong and should be avoided at all costs. While there are folks in the Amphicar community who have made successful entries at upward of 50 mph—which begs the question as to whether any video records of failed attempts exist—the best strategy involves slowly rolling into calm water from a gradual bank. At the same time, enough momentum is needed to avoid getting bogged in an overly soft bottom. Your first time can be a bit of a nail-biter. Because of its substantial weight, the Amphicar needs to displace a serious amount of water before it will float—nearly 40 cubic feet of water by our math, which we admit may not be correct. This means driving quite deep into the body of water you’re attempting to navigate—well past the point of no return if you were in a regular car and just happened to be driving into a lake for some reason. Eventually the portly little buggy bobs off of the bottom and motors away, driven by its twin propellers. Once underway, there are no special controls for boat operation except for a separate engagement mechanism to reverse the props. The gas pedal still controls the throttle, which now spins the direct-driven props through a special transfer case. The “regular” transmission is simply left in neutral, although it remains fully functional, allowing wheels and props to be driven simultaneously. This feature is particularly useful when entering and exiting the water. Directional control is maintained via the steering wheel, which uses the front wheels as rudders. This system works about as well as you imagine it might, which is to say it barely works at all. Particularly at low speeds, the Amphicar changes direction with less urgency in the water than on land, where it isn’t terribly urgent to begin with. At higher speeds, the steering is a bit more effective as more water is flowing past the “rudders.” However, the Amphicar still isn’t going to make like a jet ski and carve holes in the waves. The brakes still function as designed: Hit the pedal and the wheels stop moving. This does little to stop the Amphicar in the water, however. Hitting the pedal harder just seems to make the car accelerate toward the dock, reeds, other boats, or any other solid object that you’d rather not hit. Reversing the props is the smarter move. The weight of the car also provides a near eye-level view of the water. Since the Amphicar easily draws a couple of feet of the wet stuff, the safest operation will be in waters at least waist deep. Exiting the briny deep is simply a matter of finding solid, gradually sloping land that leaves the water. Point the Amphicar toward the exit point and engage the drive wheels just slightly before they hit bottom. In all honesty, the perceived stresses of entries and exits are far greater than the actual act. 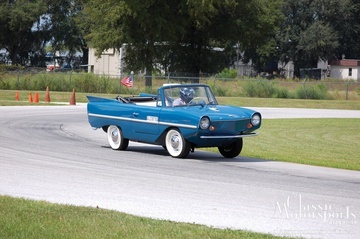 With a gradual slope and good bottom conditions, the Amphicar makes the transition rather seamlessly. There’s a reason why most boats have fiberglass hulls. For one thing, fiberglass tends to be lighter and more repairable than steel. Also, it rarely rusts. If you have a rusty fiberglass boat, you’ve either been the victim of a very unscrupulous and very talented salesman, or you need to seriously rethink your boat maintenance regimen. The Amphicar, however, is made from good old-fashioned steel, and we all know that water plus steel equals rust. Most of the surviving Amphicars—probably somewhere between 500 and 1000 seaworthy units—have seen most of their hours in fresh water. Cars regularly used in salt water have mostly disintegrated at this point. Drying an Amphicar is imperative to keeping it alive, and the process mostly involves emptying the bilge of any water that has intruded during each cruise. It’s also crucial to rinse and inspect the many seals found where mechanical items pass between dry and wet areas. 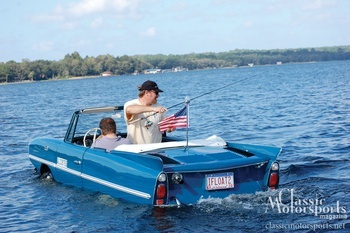 A properly restored and maintained Amphicar should have no more rust issues than a regular car used in a rainy climate. We found the sealing on the Hornsbys’ Amphicar to be rather excellent. In fact, Ray reports that they have never needed the automatic bilge pump to evacuate water intruding from the undercarriage. It has been used to pump out water splashed into the cockpit courtesy of passing cabin cruisers, but the marine-grade upholstery shrugs off the inconvenience. The biggest risk of water intrusion is through the doors. If they aren’t properly sealed using the additional “water tightness” lever, bad things can happen. Since it’s a separate lever from the regular door handle, you have to remember to latch it before entering the water. Don’t worry, though. If you forget, your wet feet will remind you. The good news is that parts availability is rather decent for such an unusual car. Since the factory was prepared to make many more units than the number actually delivered, spare parts aren’t a big problem. And thanks to a rabid following today, reproduction pieces and proven modern substitutes are available when factory parts are not. From windshields to the extra-thick taillight seals, if you need it for an Amphicar, it’s probably out there. Those parts might not be cheap, but you can probably stomach the cost if you can afford the car in the first place. Amphicars have enjoyed a bit of a price bump in recent years, possibly because of their increasing rarity, or possibly because of their perceived usefulness in the coming zombie apocalypse. But to answer the question posed in the title of this section, yes, you do want one. Rarely does a machine exceed the sum of its parts in such a dramatic fashion. As a car, it’s an unremarkable early-1960s European convertible sedan. As a boat, it’s a heavy, deep-riding, slow way to navigate the blue. But as a carboat, there’s simply nothing better, cooler, sillier or just plain more wondrous than the Amphicar. 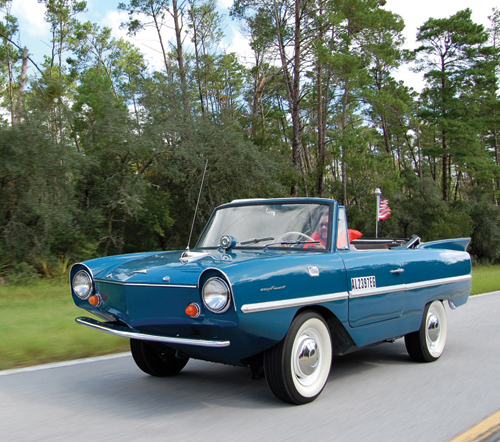 Join Free Join our community to easily find more Amphicar articles.